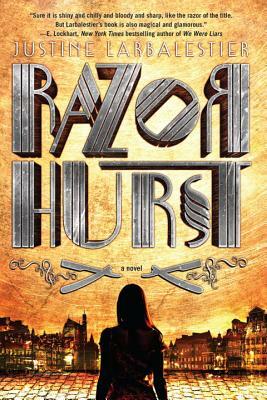 "Vivid and bloody and bold and fast--I feel like Razorhurst is in my bones now." Sydney's deadly Razorhurst neighborhood, 1932. Gloriana Nelson and Mr. Davidson, two ruthless mob bosses, have reached a fragile peace--one maintained by "razor men." Kelpie, orphaned and homeless, is blessed (and cursed) with the ability to see Razorhurst's many ghosts. They tell secrets that the living can't know about the cracks already forming in the mobs' truce. Kelpie meets Dymphna Campbell, Gloriana's prize moll, over the body of the latest of Dymphna's beaus to meet an untimely end--a string that's earned her the nickname the "Angel of Death." Dymphna can see ghosts, too, and she knows that Gloriana's hold is crumbling one henchman at a time. As loyalties shift and betrayal threatens the two girls at every turn, Dymphna is determined to rise to the top with Kelpie at her side. Justine Larbalestier is the Australian-American author of many novels, including Liar, which received four starred reviews, and My Sister Rosa. Justine lives in Sydney, Australia, and New York City, though not at the same time. You can find her on Twitter @JustineLavaworm andher website, justinelarbalestier.com.